Coworking is when people rent spaces to work in buildings like Wework. It is an alternative to working from home or in a traditional office setting. People are starting to skip the typical coworking spaces and starting to work at bars and restaurants along with cafes and coffee shops. More and more people are opting to work in more fun and engaging environments. It offers an uplifting atmosphere with a more laid back feel. There are several compelling reasons why people are choosing bars and restaurants as coworking spaces. The bulk of the people who choose coworking are freelancers and startup companies. However, this also includes writers, artists and people whose companies allow them to work from home. A bar setting is not as intimidating as a traditional work space. It allows you to be a bit more relaxed and actually network with others who do similar job. You will meet people from all walks of life at the bar. It is also not a competitive or cut throat type of work environment as people try to climb the corporate ladder. Since everyone works for different companies the competition isn’t as intense so you can build some good relationships with new people. Coworking spaces, especially bars allow for more flexibility with hours. You don’t have to work from 9:00 am to 5:00 pm. Many spaces offer a wide variety of times and hours to suit your needs. This gives you more control over when you work and where. It also means that you don’t particularly need to be stuck in a stationary desk in the same spot day after day. You choose how you want to work, where you want to work and your hours accordingly. It almost seems too good to be true. This goes hand in hand with networking. As you network with others at the bar, you may be able to help someone else with a job or vice versa. You may also learn of other jobs that you have skills in. You build relationships and it helps to promote your own business growth. This in turn, builds a sense of community and pride within the coworking spaces. Many people have these long, horrendous commutes that take them hours to get to work. And then they have to sit in a tiny cubicle for 8 hours until they have to start the commute all over again. It’s the day to day grind that created a need for coworking spaces. If you just had to get up and go to your local bar or restaurant in the morning, can you imagine the stress being lifted off of you? It significantly reduces your commute and fight with traffic. 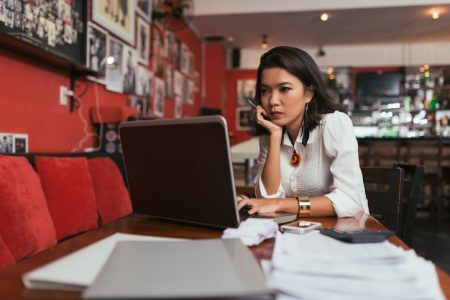 Also, many companies are allowing people that could work from home the option to work in coworking spaces so they don’t have to come into the office on a daily basis. If you typically work from home, sometimes it is distracting to be at home. You think about the housework, the dishes, and other distractions. However, when you have to get up and go somewhere, it puts your mind into the sense that you are going to work, even if the work location is a bar and not your typical office. It still gives you the sense that I am here to work. Yes, the bar may offer other types of distractions, but no more than the noisy office in a high-rise building. Freelancers and people who work for themselves have to have the right mindset to get up and do the work. You don’t typically have someone telling you how much to get done, how long to work or anything like that. You have to find a way and be committed in order to succeed at the job. A physical location away from home will give you that. Choosing to work in coworking spaces like bars and restaurants takes a sense of commitment and frame of mind. Try it out! It leads to great interactions, less stress and the ability to grow your business in ways you never thought possible. It really is amazing to think that you can do all of this at a bar.